Water as the foundation of life, water as a landscape-forming element in all of its forms, water as one of the elements, and water tamed, serving people. The exhibition offers countless angles of viewing water in the landscape, in rivers and in human lives. 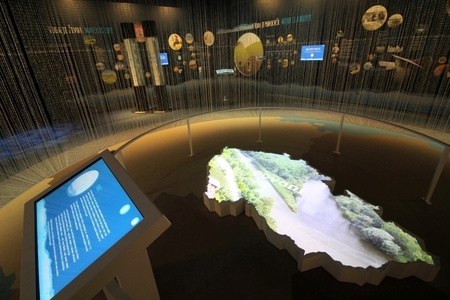 The dominant feature of the exhibition is a plastic model of the Czech Republic, on which “stories” of water are projected; the main pond system, river basins and watersheds are brought to life; and the real causes and patterns of flooding in contrast to the driest regions of the Czech Republic and the reasons why things are this way are explained. Even though we are a country rich in water sources, when threatened with drought, we are the same as the entire planet. In glass cylinders visitors can try out various properties and roles of water in the landscape – the power of water and infiltration, as well as the way in which we handle and consume water. Interactive glass “books” which we can browse through provide us with information on water as the foundation of life, the cycle of water in nature and healing water – mineral springs. All themed routes of the exhibition primarily focus on the role of humans, whose activities can affect water management, water sources in the landscape and even the use of its energy both positively and negatively. You will find the Water in the Landscape exhibition on the on the building’s second floor, accessible via the Agriculture exhibition.